You will be collected from your Darwin accommodation at 7.30am this morning for your 4 day private 4WD tour of Kakadu and Katherine. We head south along the Stuart highway and into Fogg Dam Conservation Reserve. 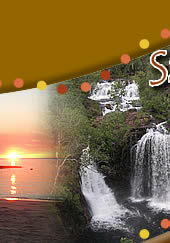 These wetlands have international significance because of their beauty a nd natural ecosystems. A great variety of fauna can be found here throughout the year as well as a large variety of birdlife. If there’s time, we’ll have a look around the Warradjan Aboriginal Cultural Centre for an insight into the cultural heritage of the park. Dinner tonight is available to purchase from the poolside bistro. We spend this morning enjoying Gunlom (waterfall Creek), where we hav e a swim in the large plungepool at the base of the falls. There is an optional hike to the top of Gunlom, where pristine rockpools and a fantastic view await you. This afternoon, we head south to Katherine, calling in to Leilyn (Edith Falls), en-route. Leilyn is part of Nitmiluk National Park and is well known for it’s picturesque waterfalls and pools, particularly the large pool at the base of the escarpment which is great for a swim. We have a swim herewith the option of taking the Leliyn Trail - a walk that takes us across the top of the waterfall, where we can have a swim in the upper rockpools and will get views of the waterfalls and Edith River from a couple of lookouts. Once we reach Katherine Township, we make our way to Nitmiluk Gorge. Overnight accommodation at Nitmiluk Gorge- your choice of fixed safari tents with shared bathrooms (no power or lighting) OR cabins with en-suites. Dinner is included with the safari tents but not the cabins. Dinner is available to purchase at the poolside bistro. We spend this morning canoeing Nitmiluk Gorge. The park is home to 13 spectacular gorges, carved out of the rock by torrential summer rains, over millions of years. Canoeing is a fantastic way to see the gorge close up and allows you to stop along the way for a swim. After lunch, we begin our journey back to Darwin, via historic Adelaide River. We arrive back in Darwin at approximately 5.30pm and you will be dropped off at your accommodation. This tour is only operated as a private charter (sole use of vehicle and driver guide) and is valid for travel from May to October only due to seasonal conditions - please enquire for prices and further details. 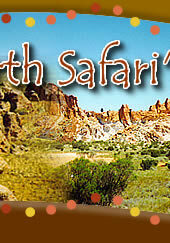 Itinerary is exclusive to Sacred Earth Safaris and subject to availability, road, weather and cultural conditions. 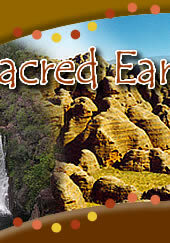 Sacred Earth arranged a wonderful 5 day experience for us in the Kakadu, around Katherine and in the Litchfield NP. We told her we would like to see birds and do some wild swimming and Danielle, our guide and driver, gave us that and more. She was a great companion, knowledgeable, flexible, well-organised and good company. From the first early morning bird watching at Fogg Dam, through 5 days of crocs and rock art, rivers, waterfalls and canyons, to the last night at memorable Mt Bundy Station, we had an unforgettable time and loved every minute. The Yellow Water sunset guided cruise was just wonderful. Thanks Dani, we really appreciate your professional expertise.